Use iPads or Android tablets to gather feedback from customers in person. Our on-site surveys are easy to create, fun to do, and provide fast, actionable insights. Create beautifully branded customer satisfaction surveys in minutes. 35+ question types and intuitive design make it easy to collect the information you need. View daily, weekly, and monthly satisfaction scores with CSAT and Net Promoter Score (NPS) reporting. Get a live pulse of your guests, and share findings with others. Collect customer feedback anywhere, even if you don't have a reliable internet connection. Your data will sync automatically when you reconnect to the web. Access your customer data as soon as it's submitted. Instant graphical reports help you understand your guests and make smarter, data-driven decisions. Real-time notifications allow you to address negative feedback before it becomes a bad review. Use response alerts to route feedback to appropriate team members. Use automated email confirmations to thank customers for providing feedback, and ask happy visitors to write a positive review on popular websites like Yelp. With QuickTapSurvey’s customer satisfaction surveys, Toronto Pearson International Airport was able to rapidly improve their security screening process through the collection of over 55,000 survey responses in just one year. Easily connect your surveys to apps like MailChimp, Zapier, and Salesforce for easy data management. Add new customer emails to your database, send text messages to survey takers, update your CRM with new information, organize feedback in your G Suite, and much more. Jump in immediately with customer feedback survey templates already created for you. 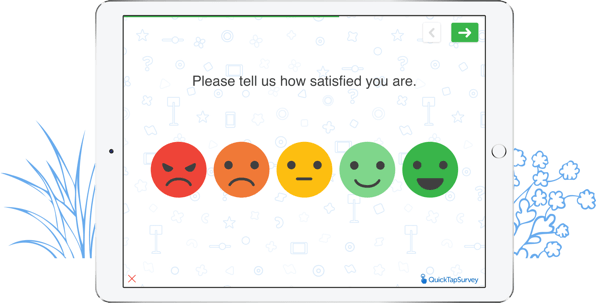 See QuickTapSurvey's customer satisfaction surveys in action by starting a free trial. No credit card required.